The beginning of the year is always hectic, but now that the school year is a few months in, your students are becoming more comfortable with their assignments, including their writing capabilities. Now that you know your students better, how do you effectively respond to their writing? Reading your students’ writing and focusing only on the faults that you find. Commenting on a student’s written opinion, rather than on their writing. Focusing on the “style” of the paper, and not the actual content itself. Using a red pen to edit. The red yells at your students that their writing is covered in mistakes. Instead of using a red pen, use a pencil or pen color like green or blue. Don’t make TOO many comments on your students’ papers. They will be easily overwhelmed, and might not be able to distinguish between lower-priority comments versus higher-priority comments. 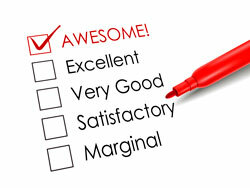 Provide both positive and constructive feedback. Young students are especially prone to feeling discouraged if all they hear are negative remarks about their writing. Always make sure you point out both their strengths and weaknesses. The goal is to build their confidence, not drag it down. Make a point to focus your attention on the organization, meaning, and flow of your student’s writing. Commenting on student writing improves with practice. As you grow more comfortable reviewing your student’s work, it will become faster and easier for you. For elementary aged children, it is best to avoid focusing solely on grammar and syntax errors. I suggest circling the errors for your students to go back to and have them revise/edit, rather than making the changes for them. Use a rubric to score your student writing samples. At WriteSteps, we use the 6 Traits Rubrics at all grade levels. Students in grades 3-5 first score themselves in pencil using the same rubric and then complete a self reflection. Next, the teacher scores and makes comments in pen. 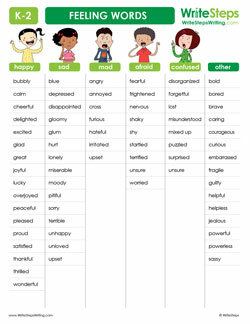 This helps students identify their own areas of strengths and weaknesses, which really boosts student confidence. For deeper reading on 6 tips to successfully score student writing using the 6 Traits rubrics. 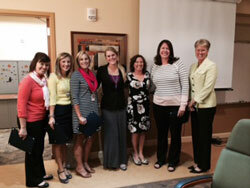 Superintendent Lisa Brown Recognizes Palmyra Area School District WriteSteps’ TeacherStars! Do you want to be a TeacherStar like the elementary teachers of Palmyra Area School District? We are seeking TeacherStars to model WriteSteps lessons for our nation’s teachers. This is an opportunity for you to make an impact outside of your classroom. In an effort to increase our videos to teach the nation’s teachers, any teacher that creates a video we use on eWriteSteps, will receive $200.00! Sometimes naming or describing a feeling can be difficult. 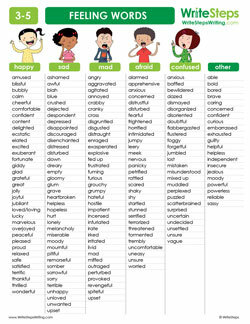 Here are two posters, one for grades K-2, and one for grades 3-5, that your students can use to help them find the right words to write while working on a writing piece. Stop by the WriteSteps booth at the New York State Reading Association Conference and say hello to our National Presenter, Kim Gates! She will be able to answer your Common Core writing and grammar questions! Don’t miss her presentation, “7 Keys That Inspire Success in Common Core Writing,” on November 10 at 2:50 p.m.
WriteSteps will be at the National Council of Teachers of English Conference in Washington, D.C. located at the Gaylord National Resort. Stop by the WriteSteps booth to say hello and enter for your chance to win a free one-year trial of eWriteSteps!